The grief experienced after the death of a beloved pet often cuts as deeply and lasts as long as that felt following the death of a family member or friend — and, in some cases, even more profoundly. Whether furry, finned, feathered or otherwise, we form a strong physical, mental and emotional attachment to our non-human companions during their lifetimes that is perhaps never felt as keenly as when a dearly loved pet dies. Here are 10 meaningful ways you can memorialize your deceased pet and keep its memory alive in your heart and mind. If you have a vegetable or flower garden or any quiet little space outdoors, you could dedicate a portion of your property to your beloved pet to create a memory spot. 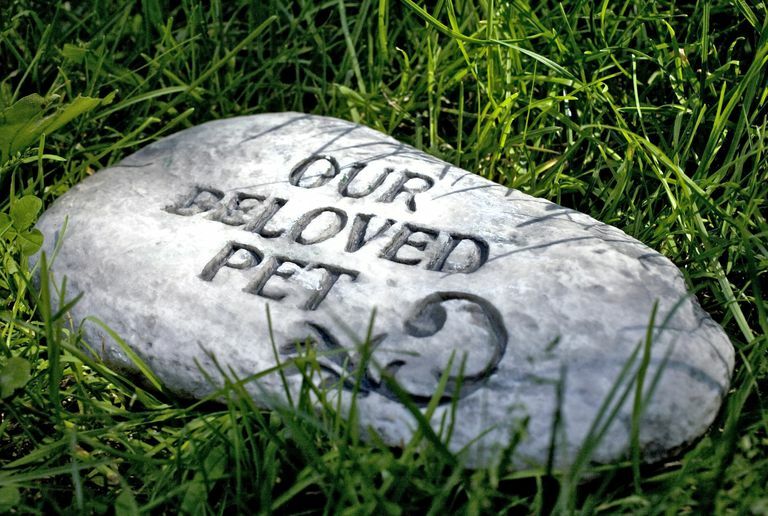 This might be as simple as installing an engraved marker or memorial stone with your pet's name on it that brings your beloved companion to mind when you are near. If space and interest allow, you could also add a stone or cast metal statue of your pet (dog, cat, bird, etc. ), a water feature, such as a fountain, or even a statue of St. Francis, the patron saint of animals. The increase in the number of people selecting cremation worldwide in the past several decades has given rise to an extraordinary number of ways to incorporate those cremated remains into meaningful memorials and ceremonies. Today, the sky's the limit (literally) if you seek something different versus burying or scattering the "ashes" of your non-human companion. Among other things, your options include memorial jewelry and paintings that include a small portion of your pet's cremated remains; urns in the form of birdhouses or hourglasses that likewise use a portion of those ashes; and even transforming those cremated remains into genuine diamonds or coral reefs beneath the sea. One company will even use your pet's cremated remains to create a special fireworks display that you can set off as part of a memorial service. Visit Heavens Above Fireworks for more information. If you're looking for a simple, inexpensive way to memorialize your pet, this idea takes advantage of something you probably already have in your possession: your pet's identification tag. Whether added to your key ring or worn on a bracelet or necklace, the presence of this engraved ID medallion will surely bring the memory of your beloved pet to mind whenever you see it. In addition, if you cremate your pet and receive/keep the cremated remains, you might consider adding your pet's ID tag to the outside of the urn. Depending on the style of the container, you could affix the ID tag around the urn's neck using ribbon (or even your pet's collar, if it fits), or glue the ID tag to the lid/exterior. As noted earlier, many pet owners cremate their beloved non-human companions but often feel uncertain about what to do with the cremated remains or "ashes." Fortunately, numerous companies provide urns specifically designed to hold the cremated remains of pets, but if you can't locate something pre-made that you like, why not design your own cremation urn? Many providers offer extensive customization options for pet urns such as adding engraved nameplates and photos to inscribing your heartfelt sentiments or an appropriate quotation. Due to the easy availability of creating/ordering custom window decals online, a growing number of vehicles on the road now serve as "mobile memorials." These decals generally include the name of the deceased and his or her birth and death dates, but can also include additional text, such as a quotation or personal sentiment, as well as an appropriate graphic element. Not limited to memorializing human loved ones, memorial window decals offer a great way to remember and honor your beloved pet, too. Many providers offer specific sections on their websites devoted to memorial window stickers/decals for pets, so you should have little trouble locating a company that can produce a meaningful decal for you. Unfortunately, approximately 6 to 8 million dogs and cats enter animal shelters each year according to The Humane Society of the United States. Sometimes lost, often abandoned or neglected, these animals stretch the staff and financial resources available to care for them, resulting in the euthanizing of roughly 2.7 million cats and dogs annually. Fortunately, opportunities to help make a difference in the lives of animals abound — and probably even in your community. Just visit the VolunteerMatch website and click on the "Animals" tab for a list of local organizations in need of your time and talents to care for these shelter animals. As noted above, the pet overpopulation problem stretches the resources available to animal shelters and other animal welfare organizations pretty thin, so why not make a charitable donation to a worthwhile cause or group, whether local or national, in your beloved pet's name? Most organizations today accept financial contributions online, either as a one-time donation or recurring, and you can often donate in memory of your beloved non-human companion. In addition, you might search for facilities attempting to raise funds to pay for a building expansion or relocation. Often, these companies will sell memorial plaques and/or bricks or paving stones engraved with the name of a loved one in order to solicit donations. Numerous cultures have long used trees as symbols of life and existence, bridging the gap between earth and heaven, such as the tree of life in Christianity and Judaism, and the world tree "Yggdrasil" in Norse mythology. Profound symbolic implications aside, planting a tree in memory of your beloved pet offers a wonderful way to beautify your yard or a public space while establishing a living memorial that you can enjoy for many years to come. You might consider adding an engraved plaque or memorial stone at the base of the tree, too. And even if you don't have the space or you seek a meaningful way to express your sympathy for someone who lost their non-human companion, there are numerous companies that will plant a tree in honor of a beloved pet, such as the Arbor Day Foundation. Typically, these companies will plant a tree in a state or national park and then send the designated recipient a printed card or certificate announcing your thoughtfulness. Most people list their personal photographs and videos as the most valuable, irreplaceable objects they possess. In this age of camera phones and selfies, chances are good that you have numerous images and/or videos of your beloved pet that you could use to create a photo or video tribute. Computer software, such as Photos (for the Mac) and Movie Maker (for PC), make it relatively easy to create a slideshow and/or movie that you can then share with family members and friends, such as this pet memorial slideshow on YouTube. If you prefer, you can also create a professionally printed photo book from your images using a service such as Shutterfly or Flickr. Of the 6 to 8 million dogs and cats that enter U.S. animal shelters each year, roughly half are adopted or "rescued" by new owners, according to The Humane Society of the United States. That means approximately 3 to 4 million shelter animals could benefit from the love and attention of a caring owner. If, and only when, you feel up to it, rescuing a dog or cat from one of the 3,500 animal shelters in the United States could prove the single best way for you to honor the memory of your beloved pet. To locate a dog or a cat — or just about any furry, finned, feathered or otherwise adorned pet in need of adoption — please visit the Petfinder website. "Pets by the Numbers," January 30, 2014. The Humane Society of the United States. http://www.humanesociety.org/issues/pet_overpopulation/facts/pet_ownership_statistics.html. Can You Legally Bury a Dead Pet on Your Property? Is It Bad Manners to Mention a Sympathy Gift During the Funeral?